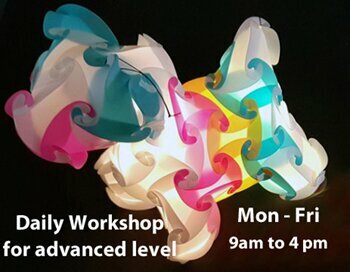 Meet us every Monday from 4 to 5 pm at Morden Library and start learning how to assemble Puzzles Lamps. We would like to welcome everyone to attend our weekly workshop activity free of charge and help them learning how to assemble their favourite puzzle lamp. Puzzle Lamps are also known as Smart Lamps, IQ Lamps or Jigsaw Light. These are not used only to enlighten a room of the house or a venue but they can also stimulate the creativity of the learner. In fact, there are no limits on the final lamp’s shape and those who will assemble all 22 puzzles, will be also able to assemble more complex designs with the shape of Heart, Star or fruits like, Strawberry and Bananas, or animals like Dog, Koala, Giraffe, Red Fish, Turtle, etc. During the workshop, one of our assistants will demonstrate, step by step, how to assemble the standard round shape lamp with 30 components. We will provide several sets of 30 components to help the participants to practice and learn how to join the components, which are available in different sizes and colours. All participants attending our workshop will be required to register their details and our assistant will provide them with the components and instructions guide to start practicing. Please note that we cannot sell any components during or after the workshop at Morden Library. Anyone interested to purchase the kits, please order them on our website and we will deliver the order the next day. All Puzzles Lamps' kits and/or any lamp built during the workshop by the participants will remain a property of Simply Fabs Ltd. All lamps assembled during the workshop will be disassembled and any kit lent to the participants needs to be returned (flat packed) to our assistant at the end of each session. Anyone of age 17 or younger must be registered by an adult. This workshop activity gives a chance to get familiar with the concept of connecting the components to build a puzzle lamp. In fact, puzzle lamps are built by interlocking each component to make the desired shape. Please check our Manual Instruction for further details. Anyone who is curious to know more about Puzzles Lamps or wants to master this activity is welcome to join us at Morden Library, which is located 2 minutes away from Morden Underground Station on the Northern Line (Black line). Please tell your friends and family and we look forward to seeing you soon.